These are not your grandma’s pearls, June baby! For your birthday, we were inspired by your exotic birthstone: the Pearl. Pearls symbolize purity, generosity, loyalty, and integrity. From enchanting islands, like Tahiti to the shores of Australia, pearls are special water gems found in both saltwater and freshwater throughout the world. Because these are born from paradise, we designed a fragrance that is both tropical and sophisticated. The sweet scents of melon, aquatic florals, citrus sea spray and sun-bleached wood mix in perfect harmony. 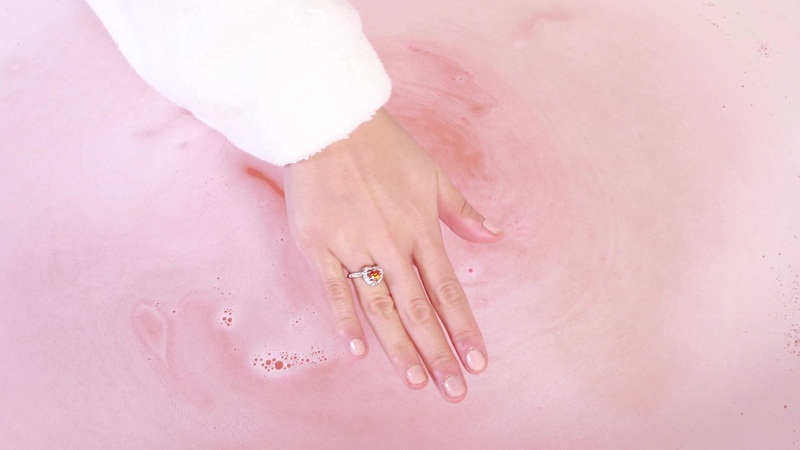 Slip into an oasis of happy island vibes with this super yummy Pearl Bath Bomb. The island scents are released as your bomb fizzes away. The skin-softening ingredients, Shea and Avocado Oil, will mix with your water giving you a refreshing makeover as you relax. Sparkle like a queen with a hidden gift inside! Each item in our Birthstone Collection features a dazzling Fragrant Jewels’ ring with a synthetic pearl center stone. There are 10 rings in all – and one of them is a rare ring with stunning black synthetic pearl center stone.